Most independent musicians are precarious workers. Why have so few of them joined their trade union? I write about music, as a historian and journalist, and play in a band. We receive a meagre amount of money from gigs, merchandise and royalties, despite having been played on BBC Radio 6 Music several times and being known in certain circles. Our music is sustained by the good will of others in similar bands, avid music fans and dedicated promoters. The money for gigs never covers our overall costs and the ‘exposure’ is unlikely to make us financially self-sufficient, but we’re committed to certain sounds and musical practices and distrust the music industry. Fortunately, music is not our primary source of income and our day jobs are well-represented by unions. We are members of the Universities and Colleges Union, the National Union of Journalists and the Communication Workers Union. We fit into a culture of semi-professional or part-time musicians that broadly identify as members of a do-it-yourself or independent music culture. Included within this group of people struggling to defend a space and network for music-making outside the ever-odious music industry, there are some who make a living, or a significant part of their income, from music. I have, however, never found any that have had meaningful interactions with the Musicians’ Union (MU). This seemed surprising considering the political engagement, activism and, more often than not, support for the Labour Party within DIY and independent music culture. One musician I questioned described how the MU seemed out of touch to her: ‘We have to take the work we’re given, there’s no choice or rights really involved.’ Another said, ‘I have never interacted with the MU, they sound fake to me, like I imagine for session musicians, not for dweebs like me – or do you have to pay some kind of membership? I have no idea. It sounds like more admin to be honest.’ Although they once ‘looked into it,’ none of the musicians involved in the Delicious Clam DIY space in Sheffield interact with the MU, despite being located in a region steeped in union history. A Manchester-based independent promoter who had booked and promoted over a thousand gigs in twelve years had never heard a musician ask for recommended rates, and commented that my questions for this article were the first time that anyone had mentioned the MU to him. Musicians at this level are typically overworked and battling through precarious employment situations, like most workers hit by austerity. The collective power of a union could surely help here, but the MU is largely absent within this musical subculture. The responses from DIY musicians reflected some historical preconceptions about the MU. The MU have often seemed out of touch with younger people, musical avant-gardes, and even musicians in more conventional fields but working beyond the worlds of orchestras, jazz bands, classical ensembles, covers bands and music teachers. These perceptions are arguably a little unfair, but understandable: the MU’s history has been well-meaning but stuffy and highly male dominated. Its defence of the western musical tradition was often conservative. In the 1960s, for instance, the MU were critical of pop and rock undermining ‘musical standards’. However, they leapt to pop and beat groups’ defence to stop their exploitation from ‘undesirable’ management agencies. In the same decade, the MU took part in the battle with pirate radio station. This was highly unpopular with the general public, but was based on fighting unethical practices such as payola, and trying to get bands paid for radio broadcasts, along the lines of their collectively bargained agreements with the BBC. During the 1970s, the MU developed a reputation for musical conservativism, railing against synthesisers, tape machines and multi-tracking. This seems quaint now, but their interest was in how these technologies were allegedly costing musicians their jobs, whereas now they’re more considered to have changed the nature and sonic limits of music-making—creating new kinds of musicians and musics in the process. Unfortunately, when the MU finally revised their attitude to these technologies in the 1980s – including African-Caribbean deejays and producers drawn from sound system cultures in the Union for the first time – the Conservative government were hard at work introducing anti-union legislation and tarnishing unions through the press. The pertinent factor in all this, from a Union point of view, is the fact that most of the musicians involved are either not even M.U. members, or if they are, then of the more passive variety. But here they are taking an active participation in organising themselves in a way that transcends managers, agents and often promoters—the very people the Union has been trying to protect them from all these years. Local branches could be less welcoming to DIY musicians. According to Robert Dellar, a punk musician, fanzine writer and mental health activist, the Hertfordshire and Bedfordshire MU undermined attempts to put on local DIY gigs after hearing about his collective promoting Nikki Sudden’s first post-Swell Maps gig, with some local post-punk bands in support, in Watford in 1981. The local MU demanded that each musician was paid the going rate of £40 – which was unrealistic considering the support bands’ relative inexperience and the means of those promoting and attending. The young and unruly post-punk support bands responded by playing the local MU’s subsequent ‘battle of the bands’ nights to the horror of the organisers. In recent years, the MU has dropped the standard performance rate for these sort of gigs and accepts that individual members can choose to waive fees for ‘exposure’ from a live performance with an established artist with a similar sound and audience. This situation can be easily manipulated by unscrupulous people in the music industry. This is, however, where the MU can come in and help DIY and independent musicians today, who while rich in ‘exposure’ are often exploited by underhanded hip capitalists and get little recompense for their labour. I explained this situation to Matt Wanstall, the Regional Organiser for the MU in the North of England, and he offered several ways in which we can bring DIY music culture and the MU closer together. He set the scene by describing a general ‘music ecosystem’ that was significantly different to that of the 1970s and 1980s and mirrored the DIY experience. Today’s MU members typically juggle numerous musical (and non-music related) jobs, and the idea that more money can be made from a buoyant live scene belies an increasingly tough situation for independent musicians as the BPI’s figures include inflated rates for established international artists. DIY musicians who have not been engaged by the MU also have to take into account the union’s difficult task. Matt explained how the MU, with its 30,000 members – split across varied professions and with different genre backgrounds – is often forced to deal reactively to employment issues, contract negotiation and legal disputes. He argued that although it might be a while before a member needs these services, DIY musicians can benefit from the protection of access to solicitors and insurance provided by the MU. The Union can offer advice about dealing with promoters, record labels, partnership agreements, licensing, distribution and collecting royalties, all issues that affect DIY musicians. They are running sessions called ‘Mind Your Own Business’ this summer for members to learn how to protect their copyright, for instance. DIY and independent musicians could gain further help by proactively involving themselves in the MU. Matt encouraged participation by clarifying that the MU is a democratic institution so ‘by getting involved in the union, you can shape it.’ By joining up, DIY musicians can place independent music higher on the agenda and show what collective action can do. This sort of action comes naturally to DIY musicians – they begin bands, fanzines, venues, record labels, organise gigs, and work together. Considering the situation most musicians find themselves in financially, the MU might need to make some changes to accommodate people who have limited means. Perhaps they must go beyond the six month £1 fee taster scheme – which requires a commitment to a year’s membership and equates to half-price membership – that is currently running. 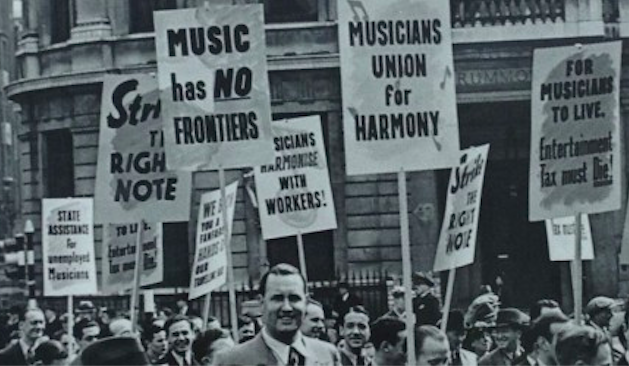 At the moment, however, the impetus lies with DIY musicians who should consider the benefits of MU membership, and take responsibility to shape the institution itself – and challenge the music industry together. Patrick Glen is a Research Fellow in the Centre for Historical Research at the University of Wolverhampton, the author of Youth and Permissive Social Change in British Music Papers, 1967–1983 (Palgrave Macmillan) and a member of the Manchester-based indie band, Unpaid Intern.